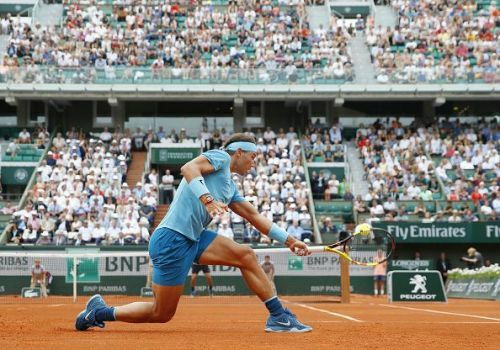 In a rare occasion, Rafael Nadal will have to play his first round match for two consecutive days as rain and poor light scuppered his bid to complete his opener at the French Open 2018 on Monday. The 10-time champion will be back in action on Tuesday at Court Philippe-Chatrier to try and overturn a third set deficit against Italian lucky loser, Simone Bolelli. Nadal won the first two sets 6-4, 6-3 but was trailing 0-3 when play got suspended. The Spaniard, who is aiming for his 17th Major, was clearly not at his best against Bolelli. The Italian managed to rip off winners from both wings, putting the southpaw on the backfoot. A passive Nadal trailed even in the second set when he went down an early break. From 2-3, he won four straight games to close out the set. The top seed and World No. 1 will have to apply the same tactics and be more aggressive when the match resumes. Fifth seed Juan Martin del Potro is another star to watch on the men’s side. The former US Open champion has been racing against time to recover from a thigh injury and is expected to be not at his best. He takes on French veteran, Nicolas Mahut. Serena Williams will play her first Major in 16 months on Tuesday when she faces World No. 70 Kristyna Pliskova. This will be the first time the former World No. 1 will be seen in a Slam since winning her 23rd Major title at the Australian Open in January last year and giving birth to her daughter eight months later. Serena hasn’t played any warmup event on clay and had been on a hiatus since losing her first round match to Naomi Osaka at Miami in March. Two-time champion Maria Sharapova’s first round match got postponed on Monday and she will now face off against Richel Hogenkamp on Day 3. In a blockbuster battle of former champions, third seed and 2016 winner Garbine Muguruza will cross swords with 2009 titlist Svetlana Kuznetsova. Top seed and last year’s runner-up Simona Halep too features in the Day 3 schedule. The Romanian, who lost the Rome final to Elina Svitolina, meets Alison Riske.